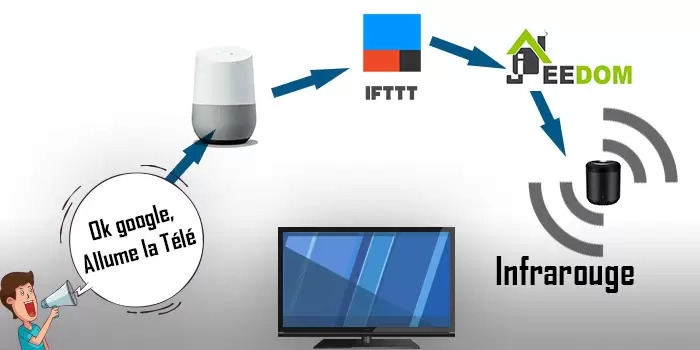 A few weeks ago I presented in a video (which you can see below) how I could with the RM 3 mini from Broadlink, google Home, my home automation box Jeedom and IFTTT turn on my TV with a simple voice command. So by lazy 🙂 I wanted to reduce this chore to a single voice command. Here is a quick diagram of the operating principle. So much for the theory, let’s move on to the concrete. How to install all this. In this tutorial I assume that you already have a Jeedom box installed. To make it work, you will need to download three modules, and a fourth one if you have a freebox like me. So you have to downloads : the IFTTT module, the virtual switches modules and the Broadlink plug-in, and the freebox remote control module. I think that’s the first thing to do. We’re going to teach jeedom and therefore the broadlink RM 3 mini our infrared controls. To do this, bring your remote control with you, approach RM 3 mini. At the same time, launch the Broadlink plug-in (with a tablet or laptop to make it more convenient:). Click on the RM 3 pro photo (even if you have the mini). And at the top right click on the “Learn a command”button. The RM then goes into “learning mode”, you only have to click on a button on your remote control while directing it to the sensors of the RM 3 mini (please paste the remote control: p). The command is detected, you can then name and save it. Repeat the operation for each button you want to save in jeedom. The purpose of the virtual switch is to be able to launch several commands for a single action. As you have understood, it is this action that will be launched by IFTTT. Create your switch, name it as you like. And don’t forget to activate it. Then go to where you will add the commands. Simply search for the order by clicking on “Search Equipment”. To run several commands add “&&” between each. Retrieve the URL of the virtual switch command URL, it will serve us in the next step. To do this, in the command you just created, on the right is a configuration icon. Click on it and you will arrive at a window similar to the one below. Right click on the “URL” link on the right to copy the action URL. Before configuring the plug-in, we will have to recover an api key on IFTTT. This is the API key of the webhook module. It’s very simple, just connect to IFTTT. 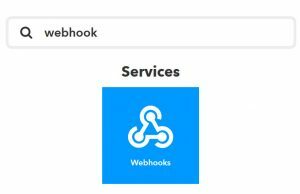 Click on “Search” and type “Webhook”. Then click on the icon “Services” of Webhooks and “Settings”. 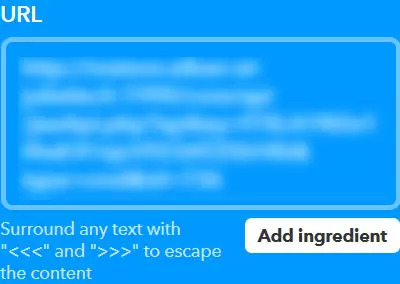 Copy it and Paste it into the IFTTT plugin of Jeedom. We’re recording and we’re done with Jeedom. Now that jeedom is properly configured, we did the hardest, and the longest. All that remains is to create the new voice command. I’ve done a lot of screenshots, because the IFTTT interface is not a very successful UX model I find. You’ll soon understand why. All your applets are displayed here, you can modify them if you wish. We will click on “New Applets” to add a new one. It’s at this point that you feel like you’re falling into a dead end and facing a headline, but without anything underneath. You actually have to click on the big one “+”. Here we will choose the application. In our case it’s google assistant. Using the search engine to find it is faster. You can define what Google will tell you. If you leave this field empty, the google home will simply reply with “OK, action in progress“. Do not forget to choose “English” in language. It is now that we will make the connection between Google assistant and jeedom. Via the Webhook module. So here too we will click on the big + again. All you have to do is paste the URL of the jeedom virtual switch command. Just click on recorder on all the windows prompting you to do so and you will be done. You can now test your order on your mobile phone or Google home. Feel free to ask questions if this tutorial is not clear enough.